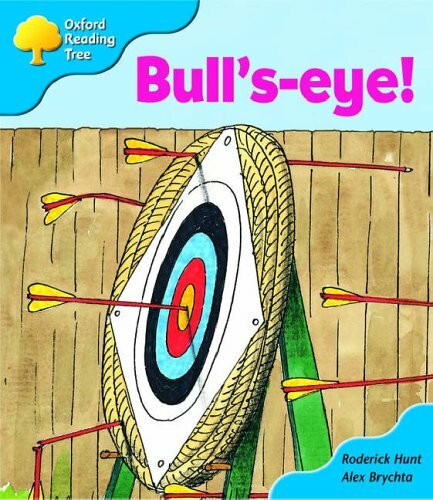 Oxford Reading Tree: Stage 3: More Storybooks: Bull's-eye! Presents a reading scheme that contains stories, meant for children. This title includes "The Egg Hunt", a story at Stage 3. It offers teaching support material - guided reading cards, and teacher's notes included free with each pack of "Oxford Reading Tree" books. It contains "Take-Home" cards for every storybook from Stages 1 - 9. "Oxford Reading Tree" remains the nation's favorite reading scheme and countless children have learnt to read with Biff, Chip, and Kipper. We are delighted to unveil its fresh new look for today's children, teachers and parents, with lively new covers and fresh artwork. Engaging new artwork and covers - Alex Brychta's unique style of artwork enthrals and entertains children, and the fresh new look will heighten their pleasure in reading the stories. With freshly drawn artwork for all the favorite core stories at Stages 2 - 5 and fantastic new covers, "Oxford Reading Tree" is more appealing than ever! Stories children love - The "Oxford Reading Tree" stories have always captivated children's imagination, inspiring them to read - and the stories and characters in the new editions haven't changed at all. Apart, that is, from an exciting new story at Stage 3, "The Egg Hunt", which replaces the "Dolphin Pool". Simplified structure - We have also simplified the structure of the scheme in response to feedback from you: "Owls" Storybooks become Stages 6 and 7 Storybooks; "Magpies" become Stages 8 and 9 Storybooks; "Wrens" at Stages 2 have become patterned stories at Stages 1+ and Stage 2; and "Wrens" at Stage 3 are now patterned stories at Stage 2. New teaching support material - In addition to the existing guided reading cards, perfect for use in guided reading sessions, we have brought out new teaching materials to reflect the needs of teachers in today's classroom: flexible, friendly teacher's notes included free with each pack of "Oxford Reading Tree" books - these are easy to store and will save you hours of preparation! ; new Take-Home cards for every Storybook from Stages 1 - 9 to help parents or carers get the most out of reading with their child; free resources website with downloadable photocopy masters; and new "Teacher's Handbook" and special edition for Scotland.